Sunshine Hostel i Rom, Italien : Boka nu! Including the price we offer you a fresh croissant, coffee or the just to wake you up in a sweet way and make you start your day. It is commonly said that 'All roads lead to Rome' but we like to say that all roads lead to the Sunshine Hostel. We offer the perfect place to stay in the midst of all the beauty, power and glamour of the Eternal City. Our hostel can only be compared to the warm bed always waiting for you at your mother's house. 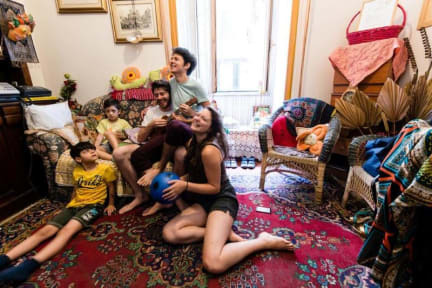 Here the family of Sunshine Hostel will do their best to make your stay in Rome the most memorable, delightful and comfortable you've ever had. If you are interested in experiencing this hidden treasure, we invite you to come and discover the secrets of Rome while staying in comfort at the Sunshine Hostel. We guarantee a warm, secure environment, and we also provide you with indispensable information that will guide you through the most complicated streets of Rome. Overall it's a great hostel with clean facilities and fantastic staff! What brings it down a little is the fact that there is nowhere to lock your stuff in, so I recommend a lock on your bags, which we had and there worked very well! Also the fact that there is pretty long to all the sights and monuments except the Colosseum. It's also a little scary neighborhood but nothing that you noticed while staying there! It's super clean, Florinda (the host) cleans every day! Our roommates were amazing!